A website packed with information needs an easy way to keep it updated, such as a content management system (CMS). 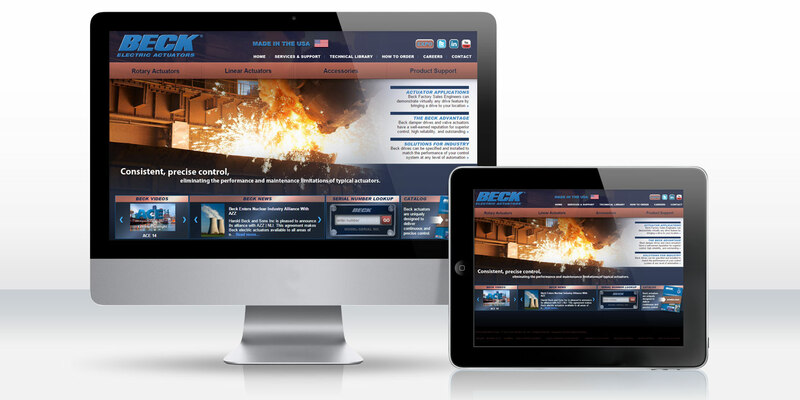 The website for Harold Beck & Sons includes information on available products, services and support offered, related applications, industries served, and a technical library with diagrams and instructional manuals. Not only was the site in need of a new design complete with user-friendly navigation through this wide range of material, there needed to be a way to keep all this information organized and easily updatable. Plus, Beck wanted to continue their search engine marketing campaign and gain a higher status in Google searches for categories related to their projects. While a presentation was a high priority, the main reason for this custom website redesign was easy navigation for the user and a web-based content management solution to make the site easier to update and manage. With all the information made available, there needs to be an efficient way to keep it organized and current. DDA website designers and developers planned to design a new dynamic presentation that showcased each important category, and organize the sections with the CMS in mind. As a top professional website design and development company with award winning search engine marketing services, DDA would make sure important industry terms were prominent in search engine optimized (SEO) site content. For the new www.haroldbeck.com, a large visual presentation was added to the homepage with rotating images for each industry Beck serves. The surrounding menus were made for intuitive navigation through all product information. Graphic menus for videos and news make for an interesting focal point on the homepage, and are easy to maintain by a site administrator through a back-end database. The administrative back-end also allows an admin to update content, diagrams, manuals, and more throughout the site. DDA programmed a custom content management system for Beck's website to make organizing and updating material manageable. A professionally designed and developed website redesign that's scalable over time and is as attractive as it is easy to use and manage.